Derek threw down his pencil. He’d been doing his homework, even though it was only Saturday morning. Running to the top of the stairs, he looked down to see his father in the living room, holding a basketball. “Almost finished, Dad. Just one more math problem.” The rule in Derek’s house was, you had to finish your homework before you were allowed to go play. It was right there in his contract with his parents, the one he’d signed the year before. He hadn’t looked at it lately—his dad kept the original safe in his bedroom drawer—but Derek was pretty sure he remembered it all by heart. “Perfect,” his dad said. “I just finished one of my homework assignments for this weekend too.” He wasn’t kidding. Charles Jeter was in his final year of classes at Western Michigan University, studying for a master’s degree. His dream was to be a counselor for kids at risk, and Derek knew that meant a lot to his father, but being with his own kids was just as important to Derek’s dad. Derek could hardly wait. Basketball was fun, and he was proud of his progress over the winter. This was his chance to show his dad just how much better he’d gotten. But the truth was, Derek’s mind wasn’t on basketball, and it wasn’t on homework, either. Because today—this afternoon—was the start of the Little League baseball season. In fact, this afternoon was his first practice! To Derek, no other sport was as important as baseball. His life’s goal was to be the starting shortstop for the New York Yankees. He only hoped he still remembered how to hit, after the offseason. For six months a year there wasn’t much baseball being played in Kalamazoo, Michigan, where long snowy winters were the rule. His dad had taken him to the batting cages twice in the past two weeks, but it was still so cold out that every time Derek hit the ball, his hands stung. Derek didn’t take the time to answer. He went back to his desk, sat down, and concentrated, long enough to finish his homework and tie his sneakers. Then he raced downstairs to follow his dad, mom, and sister, Sharlee, out the door. They all piled into the family station wagon, and drove off to the university’s outdoor basketball courts for a thrill-packed game of H-O-R-S-E! Sharlee loved to be a part of their games, even if she was too little to put the ball into the basket without someone holding her up. Her usual job was ball-hawk, retrieving the balls that got away and bringing them back to the players. Meanwhile, Mom did the scorekeeping, just to make sure there was no confusion or disagreement. She worked full-time as an accountant for a company, and she’d taught Derek to love math. Derek was eager to show his family what he could do on the basketball court. He even dared to hope he would beat his dad at H-O-R-S-E, though he knew that wasn’t likely. His dad was a really good athlete, and he was just as competitive as Derek. Derek sometimes got frustrated when he lost, as he always seemed to. But he knew his dad would never lose on purpose just to make Derek happy. Derek didn’t want to win that way anyhow. It wouldn’t feel like winning, really. Every time he lost to his dad, it just made him want to work harder, so he could beat him the next time, or the time after that—or at least someday. Derek dribbled a couple of times, drove to the basket, did a 360-degree turn in midair, and sank the layup off the backboard. Then he turned to wink at Sharlee. “Yay, Derek!” Sharlee yelled, giggling as she went to get the ball. He drove to the basket and easily made the same shot Derek had. Sharlee and Mrs. Jeter applauded, but not half as hard as for Derek. “Okay. What else have you got?” he asked Derek. This time Derek dribbled between his legs, pulled up, and sank a fifteen-foot jumper. 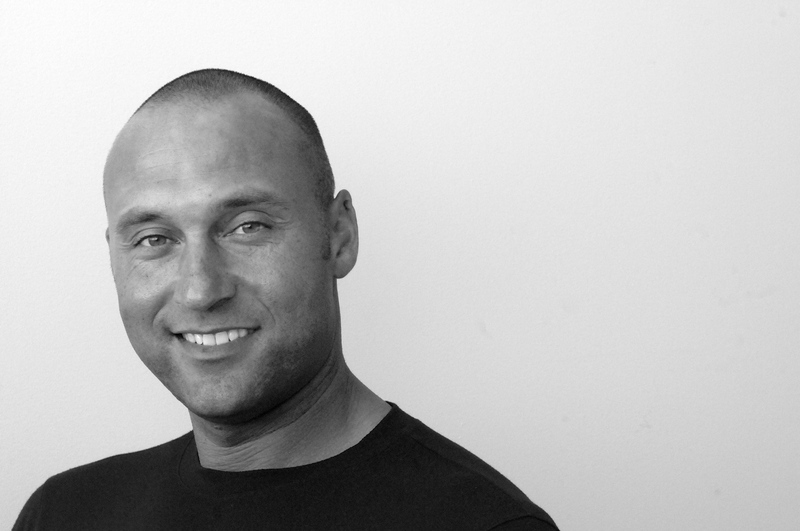 “All right, all right,” Mr. Jeter said, nodding as Sharlee and Derek’s mom whooped and hollered. He tried the between-the-legs move but got caught up and tangled, and the shot wasn’t even close. “That’s H for you,” Mrs. Jeter announced, pointing to her husband. Derek made a move, froze, and sprung into the air, letting a shot fly. The ball swished right through the net. His dad’s imitation came close but clanged off the rim and out. Her cry startled him, throwing his shot off by just enough for it to miss the rim. Derek groaned in frustration, but he didn’t blame it on Sharlee. He knew she was only five and couldn’t contain her excitement sometimes. Now it was Mr. Jeter’s turn. He did a double-fake quick drive to the basket, and then sank the layup from the far side with his left hand. Derek gritted his teeth. He’d never made that shot yet. But he was determined to this time. Sharlee handed him the ball, and he made the double move—but lost control of the ball. “Bzzzz!” his dad said, mimicking the buzzer. Soon the game was tied, and then Derek fell behind by one letter. But Derek took advantage of a miss by his dad to throw in a hook shot from fifteen feet. Mr. Jeter couldn’t match that one, and the game was tied again at H-O-R.
“But I wanna shoot the ball!” Sharlee had a pretty good shot for a five-year-old, even if you did have to hold her up near the hoop. In fact, she was a really good overall athlete for her age. Mr. Jeter saw Vijay, shrugged, and nodded. He bent down so that Sharlee could leap into his arms and take some shots. Mrs. Jeter got up and handed her the ball, while Derek turned and yelled, “Hey, Vij!” waving to get his friend’s attention. Vijay slowed his bike and came to a stop on the other side of the chain-link fence. His bike basket was filled with newspapers. Vijay had a morning route on Saturdays, delivering papers from Mount Royal Townhouses, where they both lived, all the way down the avenue to the university, about a mile away. With the money he earned, he bought heaps of baseball cards. Vijay had the best collection in the neighborhood. He was baseball crazy, in fact, and it was all thanks to Derek, who’d taught him the game when Vijay and his family had first arrived in Kalamazoo. “Not a chance,” Derek shot back. Why did his team have to be the Red Sox? As a passionate Yankees fan, he always rooted against the real Red Sox. And he’d never been on a team called the Yankees yet. This would be the second year in a row that Derek and Vijay were on the same team. Vijay wasn’t very good at sports, but Derek had worked with him on his baseball game, and he was definitely improving every year. And it was great that a bunch of their other friends were on the team. “HEY!” Derek shouted as his dad stole the ball, taking advantage of Derek’s mind wandering. “Gotta pay attention!” Mr. Jeter said, sinking a perfect shot from the foul line. Derek figured it would be an easy shot to duplicate. But the “time-out” had somehow thrown him off his rhythm. To his and everyone else’s surprise, he missed off the back rim. “Point game,” said his dad, cocking his head to one side. “Jeter” was what she called her husband, and he called her “Dot,” short for Dorothy. They both called Derek “old man,” even though he wasn’t a man yet—and he certainly wasn’t old. One more letter and his dad would win. Again. Derek gritted his teeth, determined not to go down without a fight. They went at it for ten more minutes, both of them on fire, hitting shot after shot. Then, finally, Derek missed one. The ball went out of bounds, hitting the fence right next to Sharlee—but she didn’t even budge to get it and throw it back to them. “Come on, Sharlee. Let’s have the ball,” Mr. Jeter called to her. But Sharlee wasn’t listening. She was standing at the fence, staring across the street at two boys who were passing by. Derek noticed that one of the boys was looking back at her. He seemed older than Sharlee by a year or so, although he was almost Derek’s size. Sharlee went over to her mom and sat down. Derek turned to his dad. “What’s up with her?” he asked. “Me neither,” Derek agreed. He looked down the street to where the two boys were walking. They were sharing a joke, it seemed, both of them laughing and looking back in Derek’s direction. Derek knew his dad was saying they should give Sharlee some privacy with her mom. He also knew he had a chance to finally beat his dad at something! That was before Mr. Jeter sank a thirty-footer, too long a shot for Derek to hit. His shot fell two feet short, and the game was suddenly over. It was a sincere compliment, and it made Derek feel much better about losing to his dad yet again. In the car on the way home, Sharlee still seemed out of sorts. Derek wondered what had turned her from her usual self into this silent, sulking little girl . . . . He was determined to find out, but for now he had to eat and get going. His new team was waiting for him, and he didn’t want to be late! Derek loved nothing more than watching his beloved Yankees play, especially live. In the summers he often got to go to Yankee Stadium with his grandma, who lived in New Jersey and was the world’s biggest Yankees fan. But it was rare that the Yankees came to Detroit, usually only once a year. “?‘Well,’ not ‘good,’?” his mom corrected him. His parents looked at each other and smiled. “Well, at least he’s not afraid to stick up for himself,” said Mrs. Jeter, and they all laughed—all except Sharlee. “Woo-hoo!” Derek yelled, exultant. He could feel the thrill of the coming baseball season coursing through him. The major-league season had started weeks ago, but today was the start of his baseball season. He couldn’t wait for practice to start! 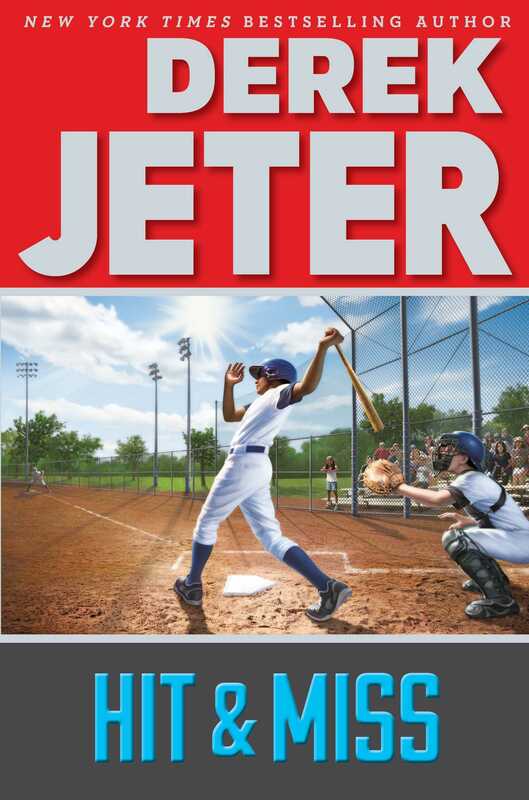 Like his first foray into middle grade sports fiction, The Contract (S. & S., 2014), Jeter presents a fictionalized story based on his own childhood. Each title in the series is based on the principles of Jeter’s Turn 2 Foundation. Hit & Miss revolves around the maxim “Think Before You Act.” ...sharp baseball action keeps the plot moving. This series will have no trouble finding an appreciative audience.